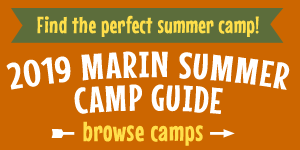 If you're a parent with young children in Marin, consider becoming a member of Pixie Park! Located on the beautiful grounds of the Marin Art & Garden Center in Ross, Pixie Park is a volunteer-run co-operative playground designed for children age six and under. Founded back in 1952, Pixie Park has been Marin's playground for over 65 years and has delighted countless children and parents. Come visit Pixie Park at their next open house on Saturday, May 12 from 10:30 am to noon and see what has made it a beloved Marin tradition for generations of families! Open houses are held on the second Saturday of each month. Pixie Park is also one of the only gated play parks in Marin County. This means entering and exiting the park requires a special Pixie Park key which ensures children will not be able to leave the park without their adult’s knowledge. At Pixie Park, parents, grandparents, and caregivers can relax knowing their kids are in a safe and beautiful environment and kids have the freedom to independently explore. Pixie Park has plenty of fun play equipment and toys, as well as a grassy picnic area. They're currently raising funds to help renovate the park and make it accessible to all and even more fun. Pixie Park also hosts numerous adult and family social events throughout the year, like their annual Spring Festival. The Marin Art & Garden Center is located at 30 Sir Francis Drake Boulevard in Ross 94957. As a cooperative, 100% volunteer-run community park, Pixie Park depends on the support of its dedicated members. In addition to paying an annual membership fee, members contribute their time to support fundraisers and various needs within the park. Members are also eligible to book Pixie Park for birthday parties. To learn more and become a member, visit pixiepark.org.